Recently spent an afternoon with my friend, Susan Fae. We had a nice lunch and played with a new toy I purchased. It’s called a Cricut, and it is an electronic cutting machine. I picked this up at Winners, but later went to Michael’s to compare prices and make sure that I had paid a reasonable price. I had. I researched online to discover what this machine could do and how to use it, but was very frustrated by how inadequate the available information was. I had a gut feeling for what this machine should be able to do but wasn’t sure about how useful it would be for me. Was this something I could use? Was this something I would use? Was this something I needed – even remotely? Decisions decisions decisions. First step was getting it out of the box and checking to make sure everything was included before we could get started. Susan Fae was anxious to get cutting, whereas I was busy trying to read the instructions and stay ahead of her. Apparently one of us is very impatient! After unpacking everything and determining that all the parts were in the box, I started reading. There was more information than I could possibly process in one afternoon, but this machine has potential. I think there is fun to be had with this device, so I decided to keep it. Once that decision was made, we started playing and cut out some words, letters and shapes. Next I need to check out the available accessories and see the types of paper that are sold to go with the Cricket. I’m sure to have lots of paper and card stock in my inventory to work with, but I need to see what is recommended. I’m like that. Here’s what the machine looks like set up and ready to cut. I’ve purchased some extra shape cartridges online but will have to wait to pick them up in Taos next month. I love free shipping, but some companies only offer that feature in the United States. Fortunately I have things to do to keep busy until then. What a surprise! OK, Ter – this is my first blog and so happy to try it with you. Reminds me of some of the “firsts” we experience in high school. Hmmmm. . . I have a Cricut and Love, Love, Love it! I had to laugh at the picture you posted – are those the same stars you cut out of purple suede and attached to that purse circa 1970?? You are right about the machine and it’s capabilities – there seems to be more than the instructions and THERE IS!! There is a program (fairly simple one) that gives you the abilitly to plan your cuts. I bought mine at WalMart for 88 or 89 dollars, and have since found it on eBay for $6. Also, check out the Oh My Crafts site for cartridges. They are way less than Michaels or WalMart – even with the shipping costs. 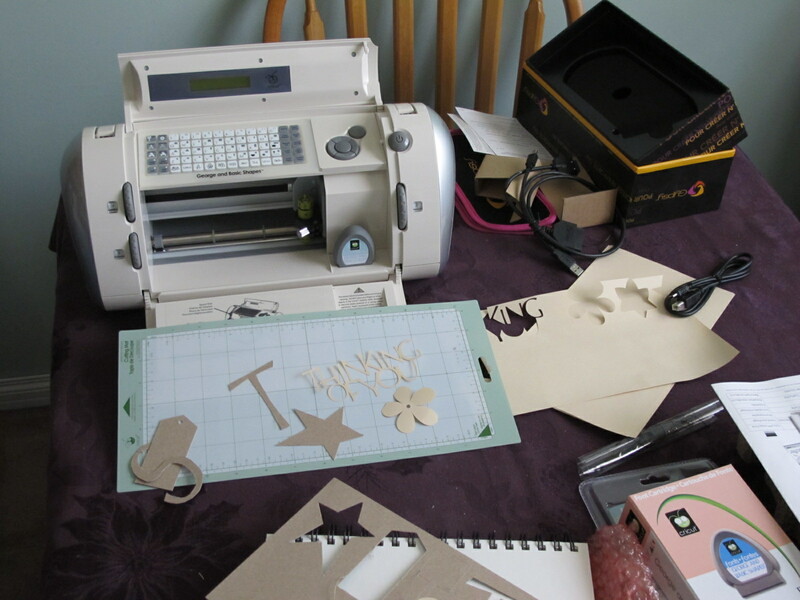 Are you using the Cricut for scrapbooking?